Temporarily dyeing your hair is a fun and easy way to express yourself and make a statement. Homemade recipes are great for when you don't feel like running out to the drug store and spending money on temporary hair color products. Whether you want your hair to be red, orange or something wilder, you can make homemade hair paint from ingredients you probably already have around the house. Use the colored hair gel recipe for temporary streaks that last a day, and the leave-in treatment for an all-over dye job that will last a few days. Add highlights to dark hair by combing lemon juice through your hair. Hair dye shows up best on light hair. Dry your hair using a hair dryer set on "hot" to bring out the highlights. Repeat as necessary, then proceed to the next section. Measure the desired amount of hair gel or aloe vera gel into the bowl. 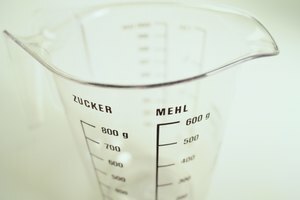 A 1/2 cup is usually more than enough, but you can use more or less depending on how long your hair is and how many streaks you want. Add powdered drink mix, sugar-free gelatin, food coloring or a combination of all three. 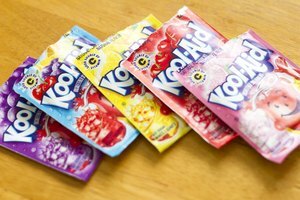 Different flavors of drink mix or gelatin will produce different colors. You can mix colors and flavors to create the color you want. Keep adding color until the hair gel is a rich, vibrant hue. Apply the gel to your hair to create colorful streaks. Wear gloves to prevent the gel from staining your hands. Wash your hair before you go to bed, as this gel can stain clothing and sheets. 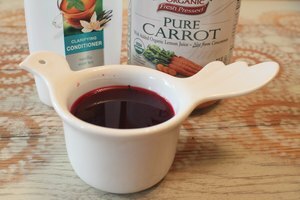 Add at least 1 cup of conditioner to the bowl. Use more if you have long hair. Add at least three packages of drink mix or gelatin, or a full bottle of food coloring. Again, you can use a combination of all three substances to get the color you want. Mix until you have a smooth paste. Apply petroleum jelly to your ears and all around your hairline. This will keep the dye on your hair where it belongs. Put on gloves to protect your hands. Then, use your fingers to apply the coloring paste evenly throughout your hair. Cover your hair with a shower cap or a plastic bag. Heat your hair using a hair dryer. This step is optional, but it will help the color penetrate more fully. Leave the color in for at least two hours. The longer you leave it in, the better. Leaving it on overnight while you sleep is best, but if you do this, wrap your hair well and cover your pillows with old towels so you don't stain your sheets. Wash your hair with a mild shampoo and rinse. You should have a temporary hair color that will last a couple of days or longer, depending on how light your hair was when you started. Use only sugar free drink mix or gelatin. Mixes containing sugar will make your hair sticky. 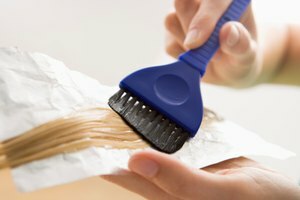 If you have extremely light blond hair, even these temporary hair color methods could stain your hair for quite some time. Do a strand test to ensure you can live with the results.